ID Card Printer ribbons cartridges colour monochrome Australia. InteractCard carries stock of the Evolis plastic ID card printer range of consumables for plastic card printing ready for immediate supply accross Australia and New Zealand. Colour ribbon consumables for plastic card printers. Ever since its initial days, Evolis ID Card Printer has always been at the forefront of innovation by creating quality-focused card printing products. As card printing demands and technologies have evolved over time, to meet the increase in card printing consumer demands, Evolis Card Printer has now updated its offering in introducing a new patented range of high-quality card printing consumables: Evolis High Trust®. This brand focuses on supporting user requirements in printing on plastic cards. 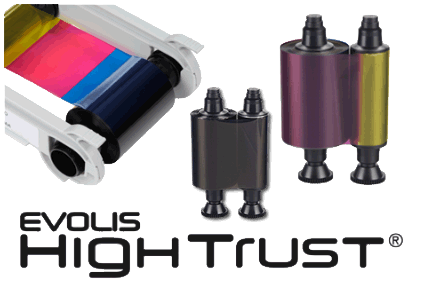 The Evolis High Trust® consumables have been exclusively designed to work with the Evolis card printers. Tested and validated by the Evolis R&D and Quality departments, these card printer consumables bring you card printing quality and reliability, maximizing the lifespan of the card printer print head. The use of consumables other than Evolis High Trust may lead to a bad card printing quality and a dysfunction of the IDcard printer. Which ID card printer is the ribbon / cartridge for? See how to regognise a genuine Evolis High Trust consumable. Drop in ribbons / cartridge allows for simple use by the most novice user. Designed with the end user in mind. Ships from Melbourne Australia, Sydney, Brisbane, Perth, Adelaide, Darwin, Canberra, Hobart & regional Australia.